The wife of a pizza deliveryman who is facing deportation has made an emotional plea for his release. Sandra Chica made the plea in a video. She said her two young daughters miss their dad and need him to come home. Pablo Villavicencio was detained by immigration officials on June 1 after delivering pizza to the Fort Hamilton military base in Brooklyn. He had ignored an early deportation order and was supposed to be deported to Ecuador this week, but a federal judge granted an emergency stay. Lawyers with the Legal Aid Society say they're hopeful he might stay permanently. "Nothing is easy, but I couldn't do this job if I didn't have hope and belief in our justice system, in the will of the American people," said Jennifer Williams, deputy attorney with the Legal Aid Society. "And with the amount of attention that Pablo has been getting, I really trust that ICE will do the right thing in this case." Villavicencio is currently being held at a facility in Hudson County, New Jersey. The Legal Aid Society released a video statement today from Sandra Chica regarding the detention of her husband, Pablo Villavicencio, who is currently under Immigration and Customs Enforcement's custody at a facility in Hudson County, New Jersey. 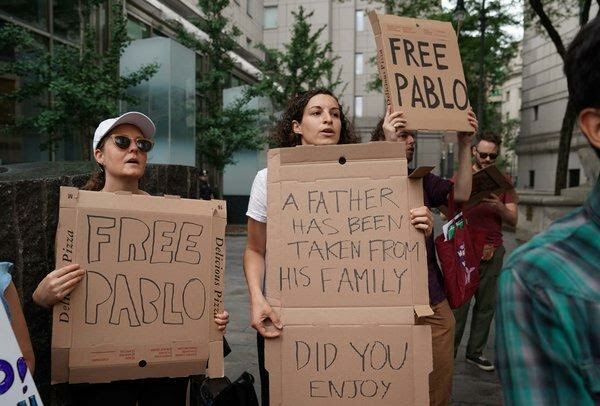 A federal judge in Manhattan on Saturday temporarily halted the deportation of a New York pizza delivery man at least until a court hearing on July 20. The judge, Alison J. Nathan, of Federal District Court in New York, ruled for the plaintiff, Pablo Villavicencio Calderon, after his lawyers filed an emergency petition earlier in the day. In her order, the judge said federal officials must file court documents before the hearing to explain why a temporary preliminary injunction should not be issued in favor of Mr. Villavicencio, who is still being detained. Judge Nathan was appointed by President Barack Obama in 2011. From 2009 to 2010, she served as special assistant to Mr. Obama and was an associate White House counsel. Mr. Villavicencio, 35, was delivering from a pizza restaurant in Queens to an Army base in Fort Hamilton, Brooklyn, on June 1 when he was turned over to Immigration and Customs Enforcement agents by a military police officer. A background check revealed that Mr. Villavicencio, a native of Ecuador, had an open order of removal since 2010. He was immediately taken to the Hudson County Correctional Facility in Kearny, N.J.
A spokeswoman for the immigration agency did not immediately reply to an email or phone message seeking comment. In a federal lawsuit, Mr. Villavicencio’s lawyers claimed that he was a victim of racial profiling at the Army base and that the detention violated his constitutional rights. Mr. Villavicencio was in the process of applying to become a legal permanent resident, the suit said, and he has not been able to present evidence in his pending application. On Friday, his lawyers from the Legal Aid Society of New York filed a petition with the New York field office of ICE, as the immigration agency is known, to have him released on humanitarian reasons. 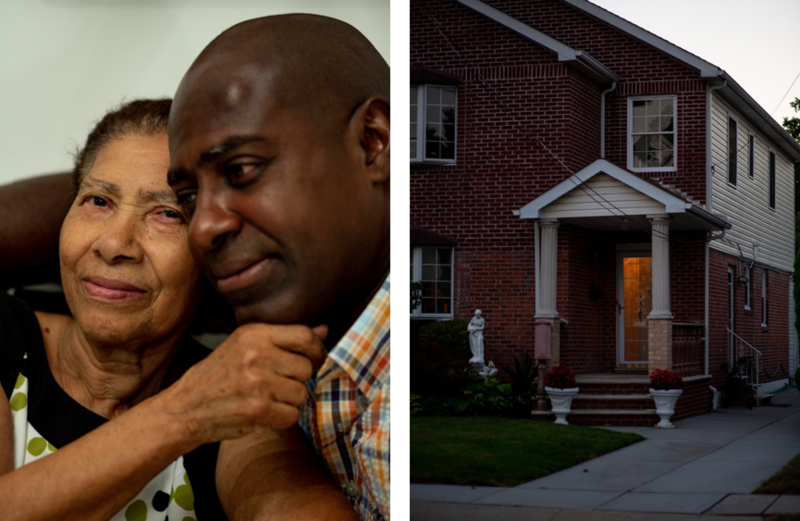 His wife is an American citizen, as are his two daughters, and they argued that since he was a primary provider for the family, he needed to be home. His youngest daughter, 2, has a congenital heart defect, according to the lawsuit. But as a judgment was pending on Friday night, the situation got more urgent for his lawyers. They learned that the commissary account for Mr. Villavicencio was suddenly cleared, which is usually a precursor to immediate deportation. This type of 11th-hour appeal to stop deportation or detention is not uncommon in immigration cases. Notably, in January, lawyers filed a petition in the Southern District to halt the deportation of the immigrant activist Ravi Ragbir. Mr. Ragbir had been detained at an ICE check-in, after fighting his deportation order for multiple years. He was sent to Miami to be deported to Trinidad and Tobago. Judge Katherine B. Forrest ruled in an impassioned decision that he should have been entitled to “the freedom to say goodbye.” Mr. Ragbir’s case is still pending. Unlike Mr. Ragbir, who had been convicted of wire fraud in 2000, however, Mr. Villavicencio has no criminal record. A native of Ecuador, Mr. Villavicencio entered the country illegally in 2008. He was granted voluntary departure in 2010, but when he did not depart, he was labeled a fugitive by ICE. But the swiftness of the immigration agency’s action was deeply unsettling for his wife, Sandra Chica, and their children and outraged Democratic lawmakers and officials. Senator Kirsten Gillibrand of New York included a letter in the lawsuit supporting Mr. Villavicencio, as did Representatives Hakeem Jeffries, Kathleen Rice and Nydia M. Velázquez. Gov. Andrew M. Cuomo sent a letter to the New York field director of ICE, Thomas R. Decker, in which he questioned the government’s rush to deport Mr. Villavicencio. Mr. Cuomo said it seemed that the detention was part of a pattern targeting New York residents, presumably because of the state’s limited cooperation with immigration officials.